While it’s the biggest force driving IT change today, mobility has yet to overhaul the things users need to do to get their jobs done: people still primarily work with email, applications, and files. When it comes to email and applications, the solutions are straightforward. Email clients have been delivered by enterprise IT for decades now, and mobile apps can be controlled via mobile application management (MAM) technology. 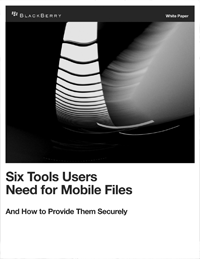 Files on mobile devices, however, are a different ballgame. Though there are only a few things users really need to do with their files (view, search, annotate, edit, save and share), the options in app stores are manifold. Yet they rarely provide a unified solution.